become a better, smarter you. Set your intentions and focus on your priority with clarity. 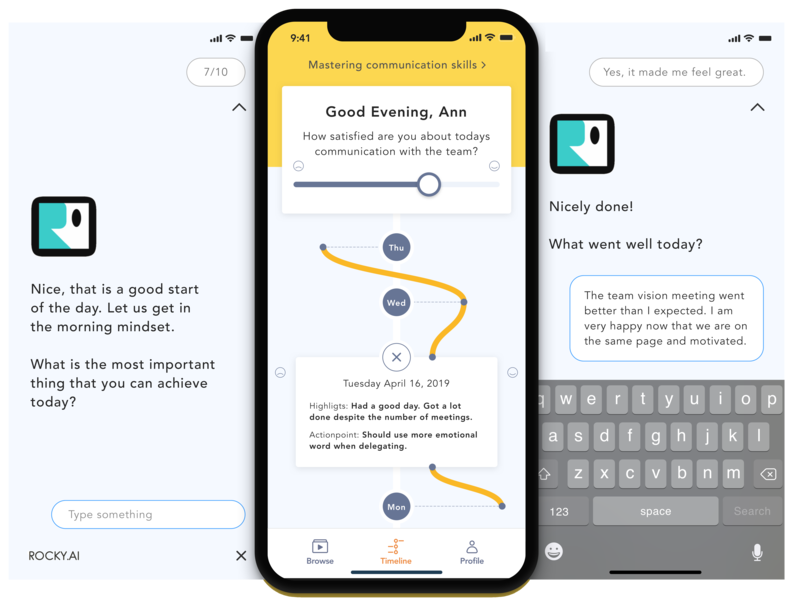 Communicate better, engage your team and connect to your network. Build a positive mindset, manage your energy and express yourself to the world. "To focus on what's important, is there anything that you can postpone or delegate today?" "Have you practiced gratefulness with your team lately?" "What might cause you distraction today? What is a strategy to avoid it?" 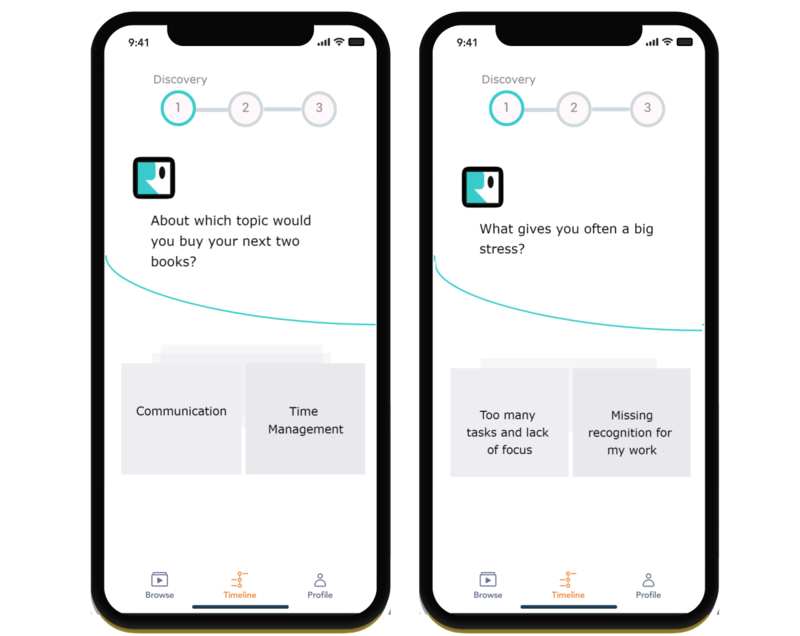 These questions varies every morning and gets more personalized for you over time thanks to machine learning behind. "How can you be 1% better tomorrow?" "Have you practiced active listening today with your team?" "Were you able to manage a solid energy level throughout the day?" 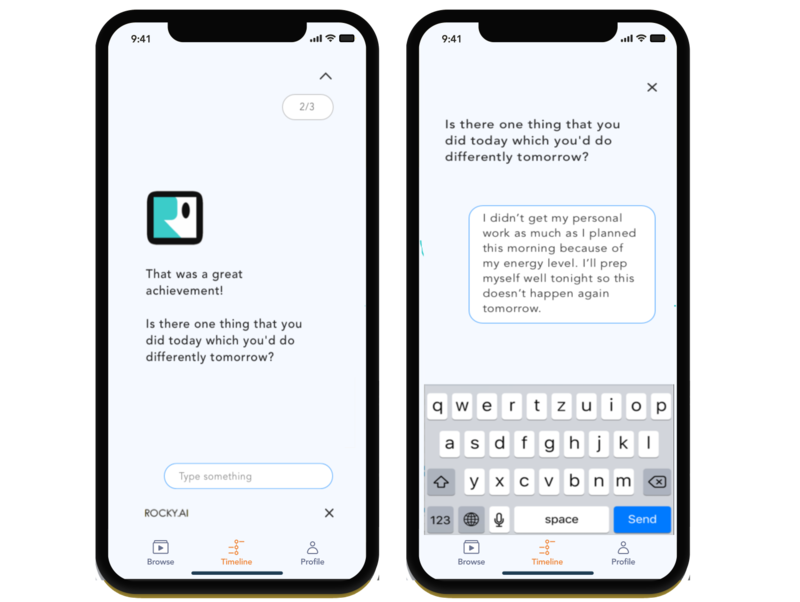 These questions varies every evening and gets more personalized for you over time thanks to machine learning behind. How can you do even more better next week? 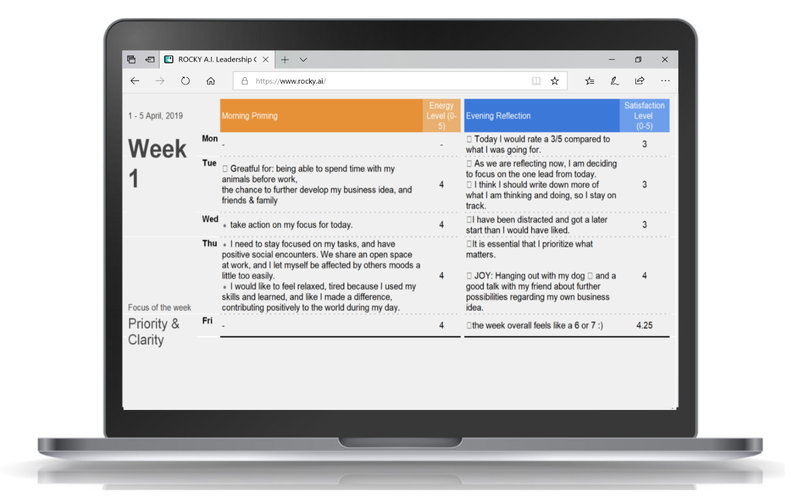 Rocky AI summerizes a weekly report for you to help you review your week and overall leadership skill status quo. Leadership is a habitual work. When you rise in the morning, you determine nearly half of your day by the patterns youâ€™ve either intentionally created or passively allowed. Start now and get your lifetime discount at US$ 27 / month for our premium plan. You have a 14 day money back guarantee and can cancel the service anytime you want. Cu sit case consequat complectitur. An putant dolorem ceteros quo. ROCKY.AI is currently limited in access. If you want to start your growth journey now, please let us know about your interest in the BASIC subscription or the PREMIUM subscription. What do you want to achieve with Rocky?